… but here on FujiRumors we do not make up rumors, or keep up regurgitating old ones, just to have something online. If you decide to invest your time on FujiRumors, then it must be time well spent, hence we only share rumors when we have fresh ones. This is why sometimes you might have to wait a few weeks before brand new rumors will be published, but it seems that your waiting is over, since I expect a wave of rumors coming. 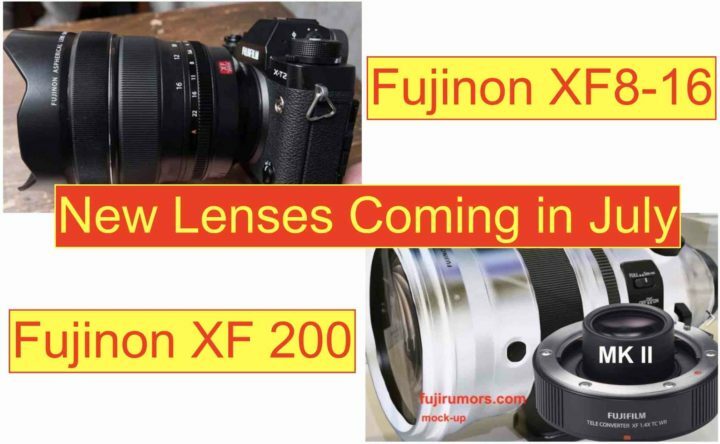 According to our trusted sources, the Fujinon XF 8-16mm f/2.8 and Fujinon XF 200mm f/2 will be announced in July. As we already told you months ago, the XF 200mm f/2 will come with the new 1.4x teleconverter, since current teleconverters only perform well down to f/2.8, but not f/2. I remind you that we shared yesterday, that it is 100% sure that the Fujifilm XF10 will be announced on July 19. A whirlwind of rumors is coming… don’t miss anything and make sure to follow us on Facebook, RSS-feed, Instagram, Youtube and Twitter.